Being old enough to remember main cultural moves in Western society for the latter half of the 20th century, one element that keeps returning to me as various unionists meld the peoples of Britain into one prosperous happy family is a song from the seventies—Blue Mink’s Melting Pot. At the time, it encapsulated rather well the enlightened aspirations of Americans who questioned racialism and xenophobia. It kept playing in my head as I read the speech by the Deputy Leader of the Scottish Labour Party, Anas Sarwar to the Road Haulage Association Conference, Hampden Park, Glasgow on 10th September 2013. In stark contrast to Ms Lamont at this week’s PMQs, he offers what he regards as a positive vision of Britain as a Union and I commend him for laying off the ritual nat-bashing in doing so. The speech catalogues a series of his reasons and I mean no disrespect if I attempt to paraphrase his main argument into “bigger is better” because—together with a shared island and 300 years of history, that is what most boils down to. There is much to commend a shared vision across as many people as possible as a force for good and his thesis that the world is simpler and more efficient bundled into larger units has plenty of examples in business, if not in nations. While individual states of the US have pride in their identity (and some dwarf many countries) no-one there or elsewhere is seriously proposing 50 seats at the UN instead of one. The EU is a laudable attempt to ensure once-warring countries jaw-jaw instead of woah-woah and the UN, while having its ineffectual moments, is clearly a force for good in a way that the League of Nations never managed to achieve. Mr Sarwar waxes quite lyrical as he lists what he perceives as the advantages; “I passionately believe we are stronger politically, economically, socially and emotionally as part of the UK. which demonstrates the positive influence for change we can be. True to the original principles of socialism, the sweeping away of national barriers and uniting all in an egalitarian workers’ paradise has a noble history. Seen, as it originally was, against a backdrop of narrow nationalism and even fascism, its appeal to lofty and humanitarian minds was strong. Mr Sarwar’s speech echoes that and therefore deserves some answer. The short catalogue above does make a powerful argument but contains the seeds of its own disproving. The phrase “demonstrates the positive influence for change we can be” presupposes that effect is always positive. In the last 10 years, the Scots have been taken to war (and dutifully served) in Iraq and Afghanistan, neither of which a majority supported. How are we stronger if our own aspirations—positive relations with the EU; opposition to nuclear weapons; conviction about a better social programme—are consistently swept aside? Ask our fishermen watching Spaniards reel in their catch if this ‘stronger’ voice has helped them. Ask an objective observer which country—Norway or Scotland—benefited most from exploitation of roughly equal discoveries of oil in their home waters. Then there is the logical development of what Mr Sarwar argues. If big is axiomatically good, why should the UK not become the 51st through 54th states of that other 200+year-old union—the USA? They’re the heavyweight of the planet; they speak (pace Mark Twain) the same language; they share a common culture (at least on TV) and we never hear the end of the ‘special relationship’ we enjoy with Washington. Who says that his argument vis-a-vis size has a scale that stops at Calais? Why isn’t he sticking it right up Tory noses by arguing for a United States of Europe that would surely prove his arguments in spades? An anciliary question that neither Mr Sarwar nor any of his unionist colleagues seem keen to address is this: if the UK is such a successful union that offers its constituent parts such wonderful advantages, why would Eire not want to rejoin? After all, they shared the same political and cultural unity as the rest of the UK up until 1922. Many Irish helped build the British Empire and numbers comparable to other regions died fighting for its continued prosperity right up until the First World War. Ireland has few resources other than its people; it has no oil, coal, gas, minerals, little that supports a modern industrial nation. Yet even when their banks came close to bust and their property bubble burst harder than the UK’s not one Irish voice suggested scuttling in under the UK’s skirts again. Funny, eh? Because one thing that Mr Sarwar and his pan-British unionists seem to miss is that people feel and behave best when they are comfortable in the knowledge of who they are. In its most fruitful form, this has little to do with knowing who you are against but a sense of common culture, common purpose and common community. This is something that—for reasons that are not entirely clear to me—at which the Scots have proved to be rather adept. With curry bidding fair to unseat the haggis as our national dish Scots appear adept at making immigrants all Jock Tamson’s Bairns—of which, Mr Sarwar can rightly claim to be a fine example. This is consistent with the historical fact that the millions of Scots who emigrated elsewhere seldom formed ghettos but assimilated early into the mainstream. Whether as soldiers of Gustavus Aldolphus, Admirals of the Czars, merchants scattered across the Low Countries or signatures on the US Declaration of Independence, the Scots diaspora became a strong integral root of the culture where they landed. And none of this smacked of the ‘narrow nationalism’ of which Mr Sarwar and his supposed broad-minded colleagues habitually and wrongly accuse those who want Scotland to be a normal country. If England were less paranoid about what lies across the Channel, if the New English were half as well culturally integrated as the New Scots, if the hankering for the dead days of Empire and influence were not such a driver for UK foreign policy, then his thesis that we Scots would be better off thinking of ourselves as British and remaining bound to them might have more persuasive traction. But we don’t. Especially since the symbolic establishment of the Parliament, Scotland has amply demonstrated its unique culture and aspirations. With no disrespect intended to our English friends, Scots are more societal and less competitive than they; we are more egalitarian and less deferential; we are more emotional and less reserved, more philosophical and less ceremonious. 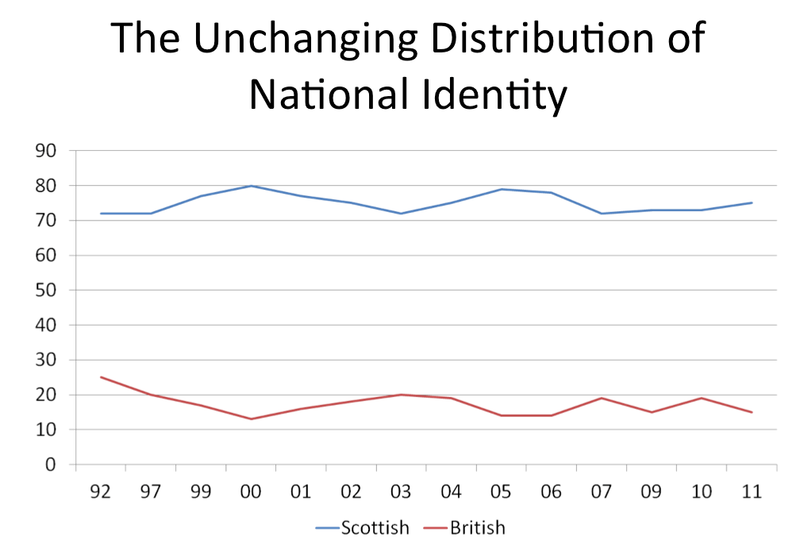 In the last decade or so, these differences have become more marked, with the general English benign ignorance about their northern neighbours increasingly underscoring their differences to Scots themselves. If this were not so, why would Mr Sarwar himself have to declare an end to factionalism in his party, by which he means Scots Old Labour and its MSPs being at loggerheads with New Labour and their MPs? Good luck to him in this. He is, in fact, thereby tackling the very distinctions that he pretends do not (or should not?) exist in his pan-British ideal. Although they have been eloquent in toeing the party line on independence, a number of Mr Sarwar’s colleagues—Douglas Alexander, Jim Murphy and Tom Harris to name a few—have demonstrated a far better understanding of the hill they have to climb in convincing Scots that their better future lies with the Union. He would do well to study their more subtle understanding of what they’re dealing with. But he seems determined to stick with the uninspired moanfest droning from Holyrood’s Labour benches as Lalamont bids fair to be remembered as the leader who out-bored the hapless Iain Gray. Though he does make a better fist of positive argument than the super-centrist Brian Wilson or the bludgeoning Ian Davidson, Mr Sarwar nonetheless ignores the cultural fact that most (and ever more) Scots identify themselves as just that (see above), even as they become more relaxed about being described as British or European. The once more homogeneous country of Britain fades into history in proportion to the coffee-coloured Scots rediscovering their mongrel roots, their own voice on social integration and the leading role they once played (from Enlightenment to universal schooling to engineering excellence) for the benefit of all. That ‘all’ includes our good friends in England, who seem to have rather lost their once-impressive way. But only after they stop mistakenly shackling us together mainly on their terms. This entry was posted in Commerce, Community, Politics and tagged independence; Anas Sarwar; national identity. Bookmark the permalink.